Broad spectrum anthelmintic paste for goats and sheep. WHAT IS ORALJECT GOAT AND SHEEP WORMER? Contains morantel citrate for the control and treatment of morantel susceptible mature and immature round worms and including certain strains resistant to BZ chemicals in sheep and goats. Use on small or hobby farms where small quantity of product can be purchased to meet the needs of the farm. Safe to use on all animals including young, stud or pregnant animals. Easy dosage administration to all age groups via a dial-a-dose syringe. WHY CHOOSE ORALJECT GOAT AND SHEEP WORMER? Contains morantel citrateMorantel citrate is a broad spectrum active ingredient that controls the gastrointestinal worms that are most likely to cause problems in goats and sheep kept in small areas. It is advised that a resistance test be conducted before any parasite treatment is used. 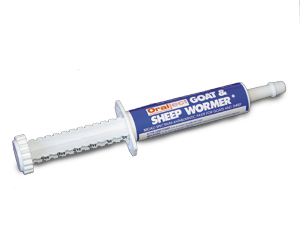 Easy to useORALJECT GOAT AND SHEEP WORMER comes in a convenient dial-a-dose applicator. This requires rotating the dial on the plunger to the correct dose rate marked on the plunger and then drenching the goat or sheep. There is no need for expensive drench equipment like guns to clean and oil and no chemical drums to dispose of. EconomicalDon’t waste money on large drums of drench that will expire before you finish them. With ORALJECT GOAT AND SHEEP WORMER you have the right amount of drench for your small size flock. Each tube treats up to six lambs or two average sized sheep/goats or one large sheep. Safe for use on young, stud and pregnant animalsThe risk of drench liquid going into the lungs is avoided with the ORALJECT system. You can treat all your goats or sheep and have peace of mind that you are administering the drench correctly. ORALJECT GOAT AND SHEEP WORMER is given orally via a dial-a-dose syringe at the recommended dose rate of 1mL/3kg bodyweight. Milk: Do not use in female sheep or goats that are producing or may in the future produce milk or milk products for human consumption. Store below 30°C (room temperature) in original container.